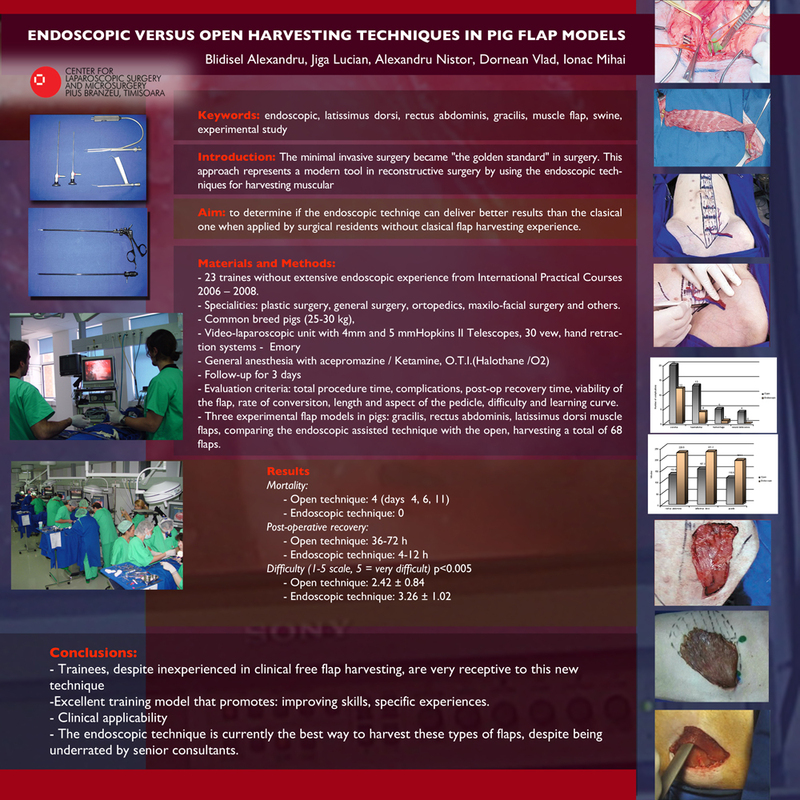 Introduction: In an era of minimal invasive surgery, endoscopic flap harvesting has not been widely accepted as the gold standard for harvesting muscles flaps, despite numerous benefits over the open technique. This is due to a lack of experience for most consultants with this new method. Aim of this study was to determine if the endoscopic techniqe can deliver better results than the clasical one when applied by surgical residents without clasical flap harvesting experience. Results: Endoscopic flap harvesting performed by trainees without extensive experience, still yields better results over the open technique and has major advantages such as minimal donor site morbidity and pain, less scarring and early recovery. The disadvantages include a longer procedure time, 2D vision and a longer learning curve. Mean operating time was significantly higher for the endoscopic procedure (120 – 210 min) compared to the open models (90 – 150 min). The recovery period ranged from 4h to 12h for the endoscopic assisted procedure versus 36h to 72h in the open procedure. The overall difficulty was not significantly higher for the endoscopic assisted model (3.26 out of 5) compared to the open one (2.42 out of 5). Conclusions: Given the low complication rate and relative ease of harvest, 24 out of 26 trainees would apply the endoscopic technique in the clinic. We conclude that the endoscopic technique is currently the best way to harvest these types of flaps, despite being underrated by senior consultants.